You guys I’m zonked. That’s the only word that accurately describes how I feel. Monday I gave up being sick and made my way to the doctor who prescribed me cough medicine and anitbiotics. I’m sure the cough medicine was prescribed due to my whining about non-stop coughing and inability to sleep. I may have even begged, “please help me sleep.” My doctor took that to heart and ordered me a cough medicine with a dash of sleeping potion. Honestly I can’t tell you what was dream or real over the past 48 hours. It’s all fuzzy. My whole body feels like it’s being pulled down by that lead blanket they put on you before taking x-rays. I’m starting to feel better and I’ve held off taking the sleeping potion all day so I’m a little less foggy than I was yesterday. I may even be able to vacuum or do the dishes today. Nah … at the very least I can push around my lead filled wrists and fingers to write a blog post! I’ve told you before I’m not a fan of bananas. In fact just saying the name makes me gag a little. Sadly bananas are good for you and I’m convinced that with a combination of greek yogurt, honey, applesauce and bananas you can pretty much sub out any of the bad things in any baked item for something healthier. Oddly enough I do like banana bread. Putting banana in bread form makes the evil mushy fruit edible, even delicious! When I was on Pinterest recently I found a couple of banana based recipes I thought I’d try. Hence this post. Bananas two was (the good way and the bad way). The good way – Banana Oatmeal Cookies (aka Germ Cookies) – Monday I couldn’t think of a single thing I wanted to eat. Nothing sounded appetizing. That is when I noticed the bananas on my counter were at the “very ripe” stage and decided to whip up a batch of cookies. I’ve made these before so I knew that they would be worth the trouble of standing up and forcing myself into the kitchen. There are many versions of this cookie on Pinterest so I’m not sure who to give credit to. You actually don’t need a recipe. 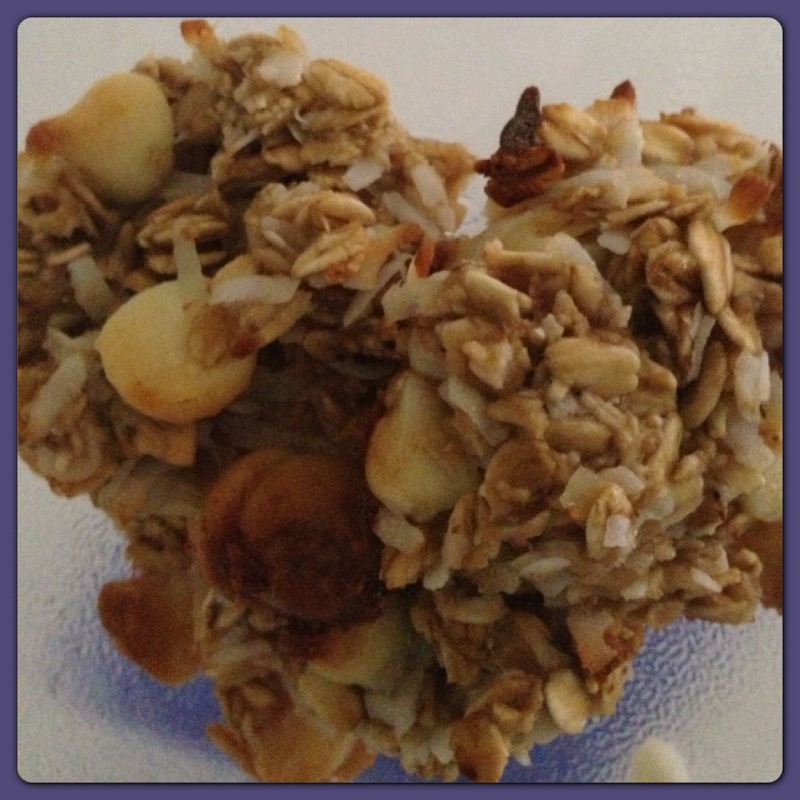 Mush up 2 bananas, add a cup of oats, mix, put blobs on a cookie sheet and back at 350 for 15 minutes. Done! The first time I added white chocolate chips and coconut (because it was in the same place as the white chocolate chips and seemed like a good idea). The second time I added another banana and another cup of oats, then when the cookies where almost done I plopped a chocolate melt on top. My goal was to have the melt, “melt” all over the cookie so that it was covered in chocolate. I used this method because I was lazy and zapped of energy from cough syrup. It didn’t work. You are better off using chocolate chips inside or melting the “melt” and dipping the tops of the cookies in the chocolate. Don’t worry. I still ate them! As I was mushing the bananas and mixing in the oats I kept coughing and sniffling hence the nickname, “germ cookies.” You don’t have to use that name if you don’t want to. I really like these cookies and I have essentially lived on them since Monday. I figure oats and bananas can’t make them that bad. The bad way – Banana Pancakes – Seriously I’m almost embarrassed to write this up. It was such a giant fail it still leaves a bad taste in my mouth. The recipe for banana pancakes is easy. Take an egg, mix in a mushed up banana and pretend it is pancake batter. I’m shaking my head at myself as I write this. As I was mixing the two ingredients together it became clear to me that the only thing I was making was scrambled eggs with banana. There is NOTHING less appetizing than scrambled eggs with banana. As I cooked my “pancakes” I tried to put that thought aside and tell myself they were a delicious fluffy breakfast treat. I didn’t have any syrup around and putting powdered sugar on my mini banana omelets seemed like a bad idea so I dug in with my fork and a clear mind, then proceeded to move to the trash can, spit out everything in my mouth and dump the rest of the contents on the plate in after it. WORSE PANCAKES EVER. You can’t even call them pancakes. They are blatantly banana omelets and NO ONE thinks that is a good idea. If you have “very ripe” bananas on your counter may I suggest turning them into cookies and skip the creepy pancake omelet. I used to not like bananas, either or anything banana flavored except I liked banana flavored popsicles and ice cream! And I could usually eat banana bread. Now, I like them, but still not a fan of banana flavored stuff.